The name Malachite may come from the Greek word malakee, or malache, signifying the resemblance of Mallow leaves, or from the Greek word malakos, meaning soft. 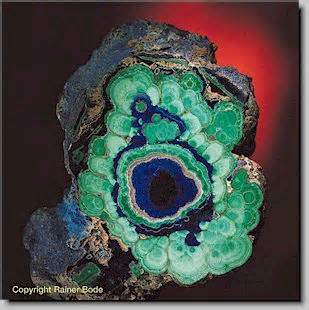 Being a carbonate of copper, Malachite is sometimes intergrown with Azurite, forming Malachite-Azurite, or with Chrysocolla, forming Malachite-Chrysocolla. Known as the mirror of the soul, the healing powers of malachite have long been recognized, and it has traditionally been used to aid in recovery from physical and emotional illness, particularly for releasing guilt. Psychologically, it can be used to help recognize and release the lingering effects of negative experiences. It is said to allow the wearer to gain insight into the cause of ill-feeling such as relationship problems, fear, resentment, and anxiety and then to release the negative emotions. Malachite is an important protection stone. Malachite absorbs negative energies and pollutants, picking them up from the atmosphere and from the body. Guards against radiation and clears electromagnetic pollution. Malachite clears and activates the Chakras and attunes to spiritual guidance. It opens the heart to unconditional love. Encourages risk-taking and change, breaks unwanted ties and outworn patterns, and teaches how to take responsibility for one’s actions, thoughts and feelings. Malachite releases inhibitions and develops empathy with others. It alleviates mental disturbances and combats dyslexia. Enables you to absorb and process information. Releases negative experiences and old traumas. Stimulates dreams. Malachite balances mood swings and heals cramps. It facilitates labor, alleviates menstrual disorders such as PMT and period pains, as well as menopause. Boosts the immune and nervous systems. Malachite lowers blood pressure, treats asthma, arthritis, epilepsy, fractures, swollen joints, growths, travel sickness, vertigo, tumors, the optic nerve, pancreas, spleen and the parathyroid. It pinpoints tumors, realigning and repairing the DNA and cellular structure that causes cancers. It can be used on all forms of cancer and enhances and stimulates the immune system. Malachite stimulates the liver to release toxins. Malachite promotes harmony and helps the various parts of the body to work together. Malachite is also said to protect the wearer from accidents and so can be useful for travelers to wear. Malachite has been also been used to promote success in business and avoid undesirable business associations. Malachite can also aid in concentration and is known as a protective stone in the field of aviation. It helps with jet lag, encourages smooth business travel, and protects in travel on congested highways. Therapeutic malachite usually displays crisp, straight black or dark-green bands in a light green base. For maximum effect, the bands should form a bull’s-eye on opposite sides of a central sphere. If the bands are irregularly shaped or muddy, the power of the malachite will be less, and the greater the contrast between the dark bands and light green base, the stronger the stone’s therapeutic effects.